[BEAUTY BUY] It's time to give up on your basic makeup removal wipes. The other day I pulled into a local discount store in search of one specific item. I needed to replenish my stock pile of makeup wipes now that summer was approaching. My intention was to keep them handy in my bag to freshen up. It gets so hot here that it makes sense to have a cooling, cleansing cloth to wipe my neck, chest, or underarms (if needed). While standing in the aisle, I immediately reached for the Neutrogrena wipes. But situated right next to them were the store brand which were naturally less expensive. My first instinct was to disregard the generic wipes but, for fun, I decided to pick them up to compare and contrast. Much to my surprise, the store brand included various natural extracts along with aloe and plant oils. It turns out that I wasn't the only one who desired a makeup wipe infused with superior ingredients. The good people who develop the Dr. Dennis Gross skin care line were on the same page. They've created my dream make up removal wipes which are chock full of healthy skin ingredients. 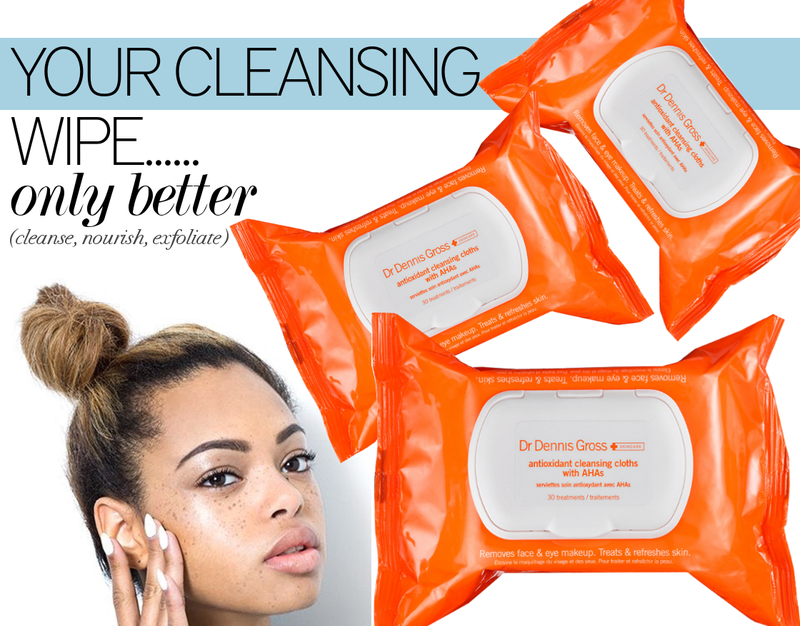 These aren't normal cleansing wipes, these are antioxidant cleansing cloths. These aren't your typical makeup remove wipes. No ma'am. They contain skin loving ingredients that go above and beyond the others. In fact, many of the key ingredients are what you would typically find in high priced skin care products. Most often, facial wipes are used to quickly remove makeup prior to cleansing. In some cases, one might take the lazy girl route and substitute them for washing your face at the end of a long night. If this describes you, wouldn't you want a make up wipe that has skin nourishing qualities as well? Don't worry, Dr. Dennis Gross has made it his mission to develop the most beneficial cleansing wipes on the market. Infused with beta, alpha hydroxy and lactic acids to gently exfoliate your skin as it cleanses. There are also high quality hydrating ingredients like hyaluronic acid & vitamin E. These wipes are also loaded with beaucoup plant extracts (too many to list). It's comforting to know that your makeup remover has acne fighting ingredients, like salicylic acid and willow bark extract as well. As you would imagine, these wipes are a bit more premium priced than your typical drug store brand. But after reading a few reviews online, it seams that they are worth the extra investment. Many of the reviewers boasted of softer, more hydrated skin after using. One clever gal shared her regimen of starting off with the antioxidant wipes than completing the cleansing process with Dennis Gross' Alpha Beta peels. Several proclaimed these as thee best cleansing wipes they've ever had the pleasure of using. The good news is that, when it comes to makeup wipes, we have lots of options. I'm sure they all do a fairly decent job. But, is fairly decent good enough? I think drug store wipes are great for the body, but I'd much prefer using brand on my face with ingredients formulated to make skin better. Especially if used a substitute for normal cleansing after a long night out.